Cade has been bugging my poor beleaguered husband about Minecraft for quite awhile now. he is nothing if not a doting uncle and loving father so he put it on one of the computers. Then a couple of kids would squeeze in front of it and play together. So he put it on another computer too. And made it s they could play in the same world, their little square computer people. But still more children wanted to play. So he got another computer set up. Who knew that playing computer games was such a social event? 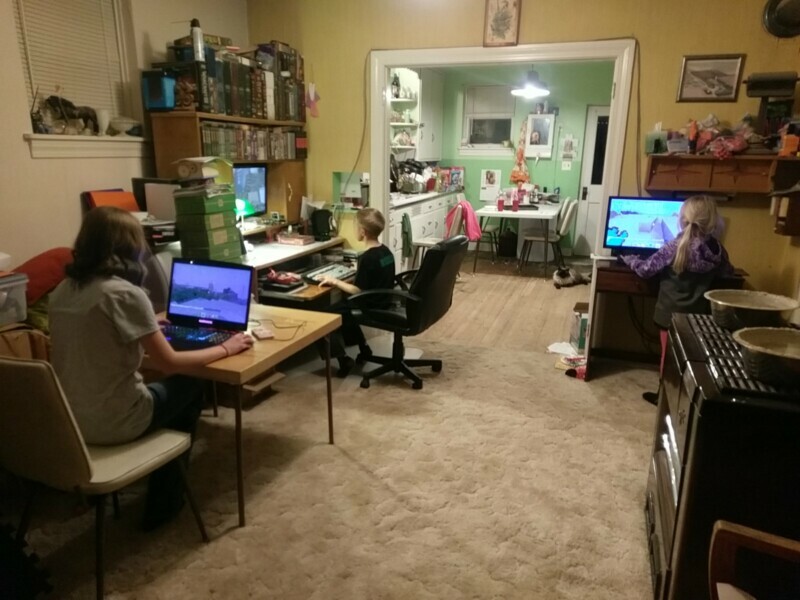 The kids and the cousins get together and play together, both in the same room and in the same computer world. Building things in a team effort, killing each other, supporting each other. Leaving their seats to g help the other one out when something is hard to figure out. Taking breaks form the very active screen time to go outside and climb on the bales. I can really get behind this kind of screen time. just not some thing I can get behind, but glad they are enjoying each other. They seem to like dying. But yes, they do play in creative mode. Larel set up his own server so they can play together but not with other people. They’ve been building huge houses and schools and aquariums. It’s fun and creative. Better than turning them loose with real people, that’s not happening. I wonder if there’s any way we can get Sabbath on our server?